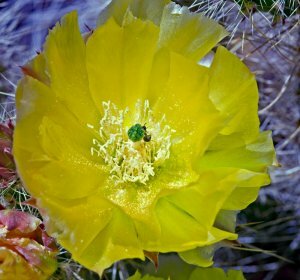 The bright yellow bloom on a Prickly Pear Cactus is full of pollen, Most prickly pear cactus have yellow, red or purple flowers, even among the same species. Opuntia is a genus in the cactus family, Cactaceae. The most common culinary species is the Indian fig opuntia. Most culinary uses of the term "prickly pear" refer to this species.